The Upland Life landscape wouldn't be complete without such treasures as Gray's, or staples like Field & Stream. And if you've been watching cable for a while, you've probably come across Hunting With Hank (or, Dash, these days! ), and a few other all-too-short tastes of upland hunting, bird dogging, clay shooting, and even game bird cooking. But there's never enough. So when we come across something that's fresh or refreshingly different, we like to share. This is just one of those magazines you must pick up when you see it on the rack. It's the sort of thing that your local Borders or Barnes & Noble may only get in a couple of copies at a time, but it's a great introduction to the bird and small game hunting scene and long (though in peril) traditions in the UK. We particularly appreciate it because they address the entire country (as they use the term) lifestyle. Guns, clothes, dogs, food, society, history, and more. You won't regret the $10. Check out our review of Joel Spring's interesting read about a season in upstate New York, and the fretting and prepping that goes into it. Thursday's Bird isn't your typical hunting tale. Scott Linden, of "Cast & Blast" fame, has spun off that show into a new gundog-centric celebration of canine uplandia called What The Dogs Taught Me. 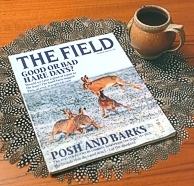 Every week, it's dog's-point-of-view exploration of different breeds, hunting styles, terrains, and game. This new season has just launched, so take a quick trip to the WTDTM page on the Outdoor Channel's web site and catch up on the episode guide and air schedule. The inaugural show highlights Springers on western pheasant, and lets us spend some time with Drahthaars (German Wirehaired Pointers). Check it out! You can also visit Linden's web site at Cast-Blast.com for more about him, his company, and his other projects (Linden also produces and distributes Outdoor Life Radio and Field and Stream Radio). While you're visiting Cast-Blast.com, follow the "Contest" link for info on how you can win a Camp Chef SportGrill, hunting gear, or other great goodies. So, warm up the TiVo, as this is one of the only excuses you have for being inside with your gundog.